Electric Glass Fiber UK Received “Company of the Year” in The Glass Focus 2018 | Nippon Electric Glass Co., Ltd. 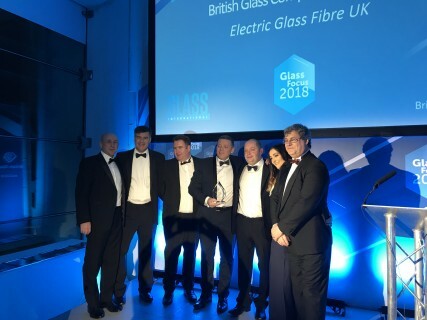 The Glass Focus 2018 were held on 22 November at the Millennium Gallery in Sheffield, UK by British Glass, and Electric Glass Fiber UK, Ltd., NEG’s UK subsidiary of glass fiber business, received “Company of the Year”, the highest accolade. British Glass is the biggest Glass Industry Group in UK. Being awarding this prize, Electric Glass Fiber UK was judged highly commended “Strengthening Business Through People” and “Health and Safety activities, “Near miss-Hiyari Hatto”, which was developed based on NEG’s Health and Safety activities”.